Taking their name from a poisonous flowering plant indigenous to Northern California, which grows outside the band's practice space, Oleander front man Thomas Flowers is the classic starving musician. Working as a busboy to make ends meet, while guitar player Ric Ivanisevich worked at a warehouse for a record chain, the band's lucky ship came in when Sacramento's KRXQ added "Down When I'm Loaded" into heavy rotation. After that single's success, "Why I'm Here" began to get major airplay, and was one of the stations most requested tracks. Now, on a their major label debut, the band displays the intense rock 'n' roll drive that got them where they are. "You'll Find Out" wastes no time in getting into the meat and potatoes of their sound. Charged rock guitar riffs scream through the air while a throbbing rhythm section busts through the air. Of course, this type of intensity doesn't stop. "Stupid" keeps the bash-it-out rock 'n' roll spirit alive, but this time adds a very melodic twist that spins around in your head and just doesn't want to let go. Flowers' voice is passionate and intense as well, sounding both sincere and scared at times, while other times sounding confident and in control. "Why I'm Here," the song that helped land the band a major label deal, starts out slowing things down a bit. Instead of tearing through the guitar riffs, they decide to let the riffs drip like rain off a gutter. The addition of strings helps grab the listener's emotional side, before the band decides to once again amp up and push the loud, abrasive sound onto you. But then they pull a 180 and slow things down, before once again diving back into the chorus and ripping things up. "Lost Cause" just keeps the nail-biting rock beats coming. Of course, they always leave room for a melodic touch to help you sink into the song a bit easier. And with the addition of the melodic bursts, they're able to drag you even deeper into their songs and keep you wrapped up in loud guitar riffs and shattering beats. "How Could I?" shows the very soft, pop-rock side of the band. Lots of strings set the mood, while the medium-sounding beats help give the song a light side, but still makes things strong enough to keep the listener awake. Ending with "Never Again," the band once again bashes things out with tremendous power and a melodic touch to boot. The guitars churn out the hooks, probably the catchiest on the album, while the rhythm section accents things nicely. 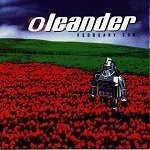 With things going in their favor to land them a record deal, and an album that will help keep the luck on their side, Oleander doesn't show signs of wear or tear throughout this eleven track disc of monster rock beats and melodic undertones. I'll give it a B+.